(L-R) Nisreen and Nermeen Abudail, the sister duo who make up naqsh collective have been nominated for the fifth edition of the Jameel Prize. Image courtesy of the artists. 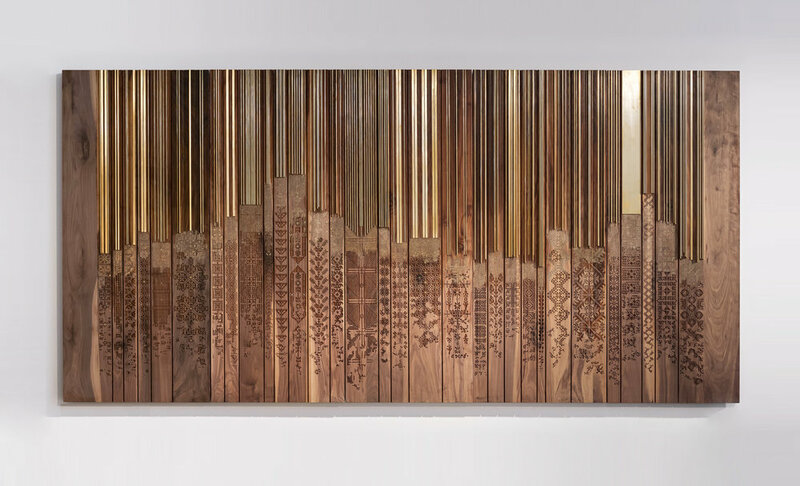 A Jordanian artist duo based between Dubai and Amman have been shortlisted for the fifth edition of the Jameel Prize. Naqsh Collective, comprising sisters Nisreen and Nermeen Abudail, are one of eight finalists for the prestigious prize awarded by the Victoria and Albert Museum (V&A) and supported by Art Jameel. Their work, The Shawl, is an artwork made of walnut wood engraved and inlaid with brass. 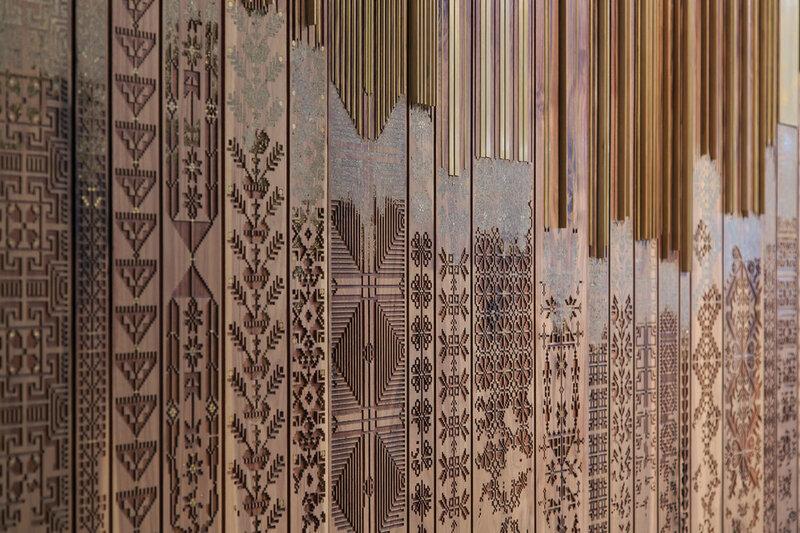 Its design is based on textile patterns originating in Palestine and resonate deeply with the sisters’ Palestinian heritage. The final winners will be announced in June, when an exhibition of all the shortlisted artists will go on show in the V&A before touring internationally. The Shawl by naqsh collective. The designers sisters Nisreen and Nermeen Abudail are Jordanian with Palestinian heritage and the design is based on Palestinian embroidery but rendered in wood and bronze. Image courtesy of the artists. The sisters' practice is based on minimalist aesthetic with a strong design emphasis and a hand-made finish. As such, the resulting pieces straddle the divide between art and design. The Shawl (detail) by Naqsh Collective. One of the shortlisted artworks for Jameel Prize 5. Image courtesy of the artists. The process begins by making a digital design of an intricate pattern to be machine cut into the base layer and then, they use brass shavings and tiny pieces of custom-cut metal to inlay into the final work by hand. The patterns are all based on traditional Palestinian embroidery, which has been used for centuries by women in Palestine to celebrate their identity. A women’s dress pattern can indicate what town or village she is from, how many children she has and even whether she is married or not. However, nowadays, the art of embroidery and textile is often sidelined as a craft and limited to the domestic sphere. Where Naqsh have triumphed is that they have brought a sleek and geometric feel to this seemingly outdated practice and succeeded in bringing out its beauty, which has been further emphasised by their minimalist concerns. The other Jameel Prize finalists shortlisted for the £25,000 (AED 128,000) prize are: Kamrooz Aram, Hayv Kahraman, Hala Kaiksow, Mehdi Moutashar, Younes Rahmoun, Wardha Shabbir and Marina Tabassum. The winner will be announced at the V&A on June 27, 2018. The accompanying exhibition, showcasing the work of the eight shortlisted artists and designers, will run from June 28 until November 25, 2018. The exhibition will then tour to museums globally, including to the Jameel Arts Centre, in Dubai, in 2019.